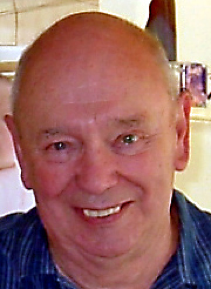 This is the ninth installment in the series of articles from Alan Haywood, one of the clubs early members. You can see the full series of articles here. 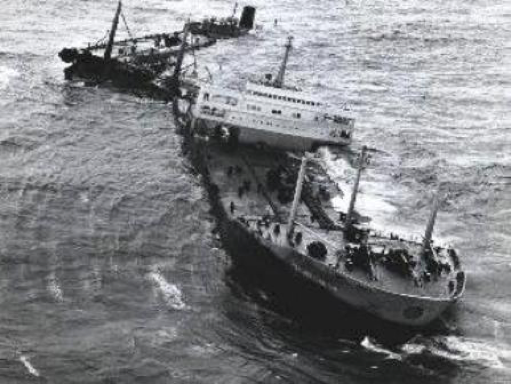 It is 50 years since the oil tanker Torey Canyon loaded with 120,000 tons of crude oil hit the Seven Stones Reef off Lands-End,26th March 1967. It was an Easter Holiday weekend and ECSAC were gathering at Lamorna Cove for the usual Easter Dive. We had booked accommodation for 12 at Tregurnow Farm a large Granit Built Farmhouse above and a kilometre behind Tater Du lighthouse. We arranged an annual Easter holiday with Mrs. Jefferies for the 18 years ECSAC held an Easter Dive in the cove. The visits started before the M6-M5 motorway system was completed, the routine was, leave about 9pm, drive to Bristol, sleep in a layby for two hours and drive on, arriving about 6am. The door was left unlocked for us and we sat in great comfort until Mrs. J brought tea and biscuits in at 6-30. Wonderful farmhouse breakfast at 8am and then we had to rush to the cove to see if the sea was still there! 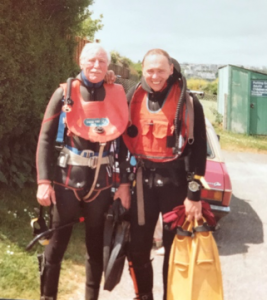 1967 was different, we had arranged a series of boat dives with John Rhodes, (Compressor supplier). He had bought a 50-foot boat called Raider. She was a prototype boat built for trials of a boat required as a high-speed assault landing craft. She failed the MOD trial and appeared as a potential Hire Dive Boat in Cornwall. She had twin diesel engines and could maintain 25 knots with a load of 20 fully armed troops seated along each side, facing inwards with kit on the deck between. Ideal as a dive boat, but not this Easter Weekend. Colin and Marg Bingham. Ann and I drove to Lands-End on Easter Friday evening. As we climbed out of the car the smell of oil was overpowering. The reef is several miles off shore and even with binoculars we couldn’t see the wreck. A naval Frigate was close in shore and traveling towards Longships Light, signaling by Aldis lamp. I watched her through the binoculars, then raised the glasses to look at the horizon. Toray Canyon was there, enormous 69,000 tons of steel wreck. Next morning we went diving, hoping to avoid the spreading oil we travelled west. As we cleared Newlyn Harbour we met a South Westerly wind, force 5-6, within the next half hour, only two occupants had avoided sea sickness, Skipper John and Rocky, Gwen and Stewart Davidson’s Welsh Terroir. We abandoned the suggested dive and moved to Mounts Bay, recovered in the calm and dived HMS Royaloe a 2nd world war casualty. At least we got wet! Raider was employed for the rest of the holiday period spraying detergent on the oil. Most of the club members joined in, or spent daylight hours collecting oil covered birds and taking them to Mousehole Bird Sanctuary for cleaning. It was decided to bomb the wreck, sections of which were still afloat. Eight Royal Naval Buccaneers set off from Lossiemouth in Scotland. The RAF and the Royal Navy dropped 62,000lbs of bombs, 5,200 gallons of petrol, 11 rockets and large quantities of napalm onto the ship. Despite direct hits, and a towering inferno of flames and smoke as the oil slick began to burn, the tanker refused to sink. The mission was called off for the day when particularly high spring tides put out the flames. Time to dive in warmer sea! Stewart and Gwen Davidson spent several summer holidays with Club Med. In the French and Italian Riviera. Talking about the deep dives he had been doing Stewart said he was impressed by the buoyancy control of the Club Med Dive Monitors. 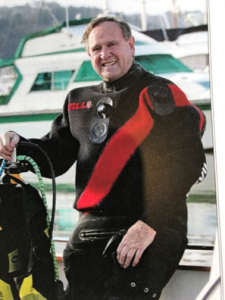 The dive group were all hanging on a shot rope to decompress, they simply adjusted their buoyancy with a “New Fangled” adjustable buoyancy life jacket called a Fenzy. He was so impressed he bought one in France. He is still wearing the original in this photograph of his last dive, many years later, with me at Brixham. I asked Lilywhites to import a Fenzy for me and by this time I was onto my third ABLJ. (Model one finished it’s life in a small museum of historic diving gear in Andros Island, Bahamas). Stewart suggested we arrange a club dive holiday in Le Lavendue, on the Cote D’Azur. He had recently had a camping holiday there and had dived with Leo Milliand from his boat Rae Manta. Leo was one of the early Cousteau divers who had to “Bale out” when he became entangled in a nylon Monofilament Net ay 60 metres. He survived the free accent and spent a long time in a recompression routine. This left him with damaged joints and walking with difficulty. I dived with him on several occasions later, in the water he was like a seal! We managed to talk a party of eight divers and two non-diving wives into a down to the Mediterranean and two weeks camping. Two overnight stops and a hair raising drive around Paris, the Boulevard Peripherieque was not complete then, we arrived at Camping Du Domain at Cavaliere. Four cars with small trailers and Heywood’s towing a caravan. (We also had a 12 foot inflatable on a roof rack and a 20 HP Mercury outboard wedged in the caravan toilet). We had several dives from Leo’s boat, including a memorable journey 10 miles offshore to a Freighter bombed in the 1940’s. We were restricted to the top deck of the vessel at 45 metres, the visibility was excellent and we could see the sand and bits of debris 15 metres below. I remember, Leo and I were the first to reach the deck and met the biggest Grouper I have ever seen North of the Equator. The holiday was so good we had two more trips, different members and used our own boats. At this time, I was using a super 8 cine camera in a waterproof housing so no photographs. If anyone has a super eight projector I have several club holiday films, we could show. My association with Tony Aylmer and Dolphin Diving Services developed quickly, diving, based at Deer Park was very popular and air sales rapidly outgrew the capacity of the compressor. 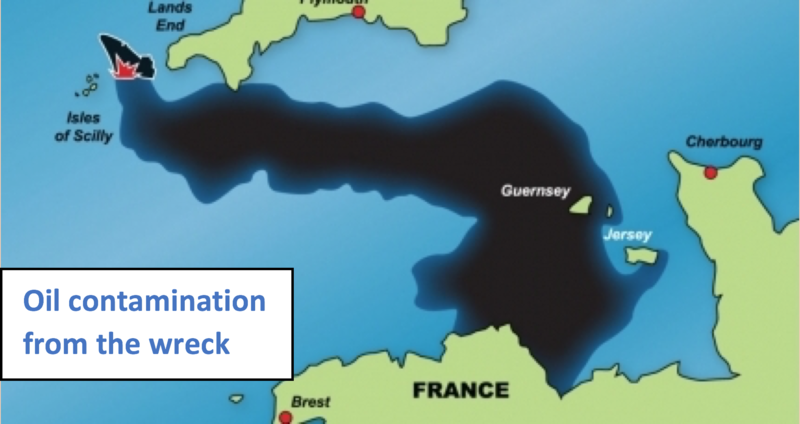 A short-term solution came when we discovered a Submarine was being scrapped in Plymouth. The work of dismantling was visible from the main road into the city and Tony went to view the compressors. Far too large but the huge storage cylinders would provide a stock of compressed air overnight and ease the load during peak times. We soon had two installed and tested. Neville quickly made lots of friends and aroused a lot of local interest with his search for local wrecks. His painstaking research into every peace of wreckage he discovered revealed lots of interest. 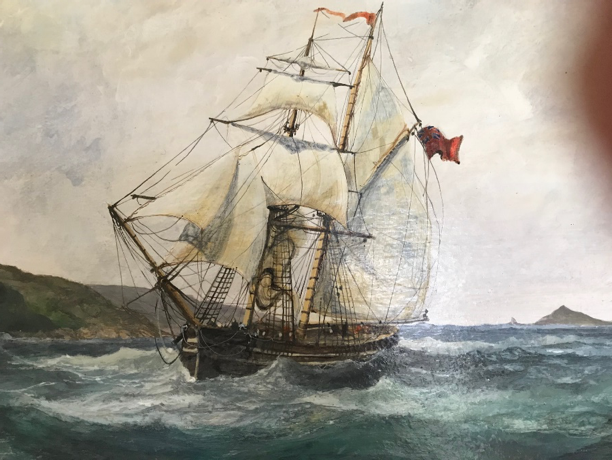 Research into a Moroccan Pirate Ship he found, revealed the crew took local people for sale as slaves in addition to raids ashore and attacks on local shipping. His search for the Armada Hospital ship SAN PEDRO EL MAYOR was epic. He spent weeks researching and I seem to have spent weeks searching miles of sea with his magnetometer to no avail. 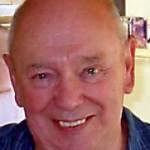 His work on the six cannon I found off Kingswear Castle in 1973 and his eventual salvage of one is still unfinished. I decided to swim below the castle walls with Kathy Curtis, to see if any second world war debris was there. During the build up for D Day there was a defensive structure attached to the Medieval Castle with a torpedo store and firing device aimed across the estuary as protection against a shipborne attack. A rail track was constructed along the river cliff edge between Kingswear and the Castle to transport the torpedoes. This was all removed after the war, but I thought any remaining bits could be interesting, instead we found six cannon which were cast in 1575. Neville found two more but no evidence of the origin. The six I found were in a semi-circle approximately 25 feet across and six feet apart. 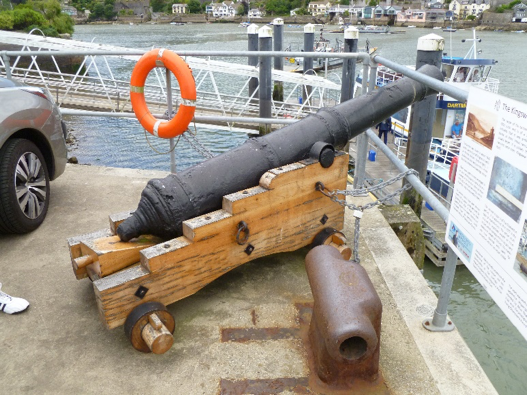 The salvaged and restored cannon is now at the end of Kingswear Fish Dock mounted on a superb gun carriage produced by member Dave Illingworth. More work is required to discover the origin of these guns. Sir Walter Raleigh returned to Dartmouth with a ship load of “Plunder”. His ship was raided by local’s contents looted and the ship fired. History declares this happened in Bow Creak, (upstream of the Naval College) but wreckage has not been found, could these guns mark the presence in another and more probable place? Why do most sport divers ignore exploration around places that have not been dived and advertised as good by dozens of people? Neville Oldham was an inquisitive diver who could visualize something happening near a protruding headland or a strange swirl of water in an otherwise calm area of water. Drift dive along a channel avoided by local boatman for no apparent reason. Something could have happened a hundred years ago, “don’t go there boy ‘tis dangerous”, but nobody knows why! A good example of this was the channel between Outer Froward Point and The Mewstone at the North Eastern point of the River Dart Estuary. In May 1973 Neville and I decided to drift through the channel on a making tide with Brian Sadler on board our boat Gladys to wave flag A at tripper boats from Brixham and Torquay The resultant find was interesting! On 5th February 1876 the Brig “Eureka” from Newcastle on Tyne bound for Devonport Dockyard with a cargo of coal became embayed off Dartmouth. She was observed to be flying her ensign inverted, indicating I am in difficulty. With tide and wind wrong for the situation she struck Outer Froward Point and sank. The crew launched their boat and arrived safely in Dartmouth. We found lots of timbers in a small area but did not have enough time for investigate in any detail. Neville found the detail in the Brixham newspaper dated 6th February and commissioned a local artist to paint the above plus two additional oil paintings of final stages of the sinking. I have this one, the other two are with Neville’s Widow Jill. It’s about time for another dive! There could be a lot of good coal fires down there! (Sorry, I forgot, people don’t burn coal anymore, Stupid Boy! Incredible Cave Diving in tropical waters next week.